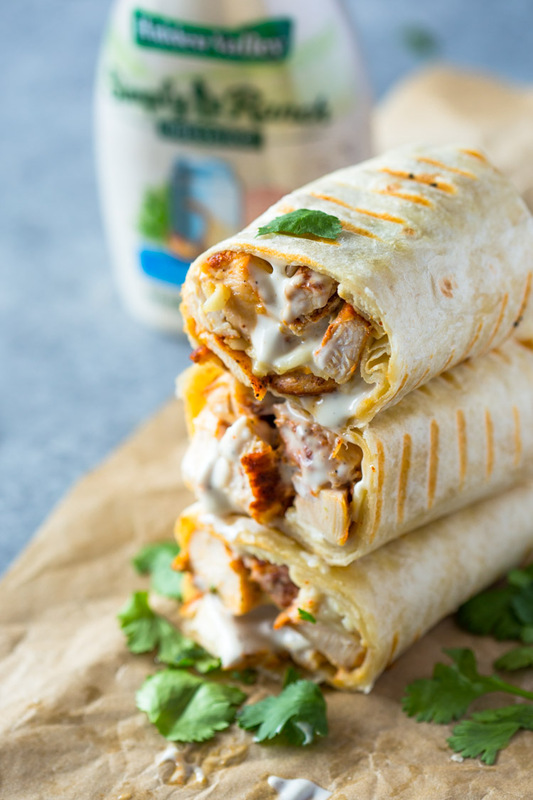 Healthy grilled chicken and ranch wraps are loaded with chicken, cheese and ranch. These tasty wraps come together in under 15 minutes and make a great lunch or snack! Ranch and chicken are a match made in heaven. Ever since I can remember, ranch was the only sauce I would dip my chicken in. What’s not to love about creamy zesty ranch. 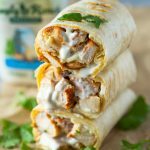 If you’re a huge fan of ranch dressing like I am, than you’re going to fall in love with these chicken and ranch wraps. They are extremely easy to make and can be prepared ahead of time for work or meal prep. These grilled chicken and ranch wraps highlight the subtle flavors of the ranch dressing. Our favorite ranch dressing to use in these wraps is the NEW Hidden Valley® Simply Ranch because it’s made with no artificial preservatives, flavors or colors. It’s made with real ingredients like buttermilk, garlic, onion, herbs and spices, all with a creamy taste! 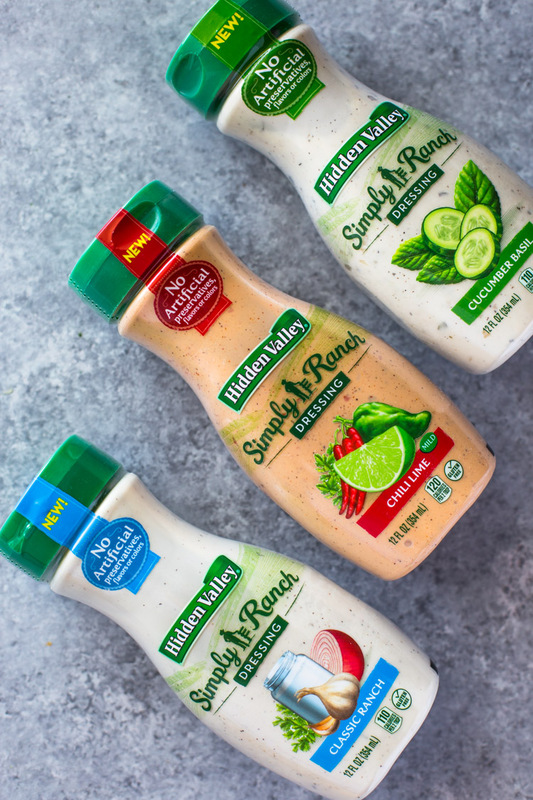 You can find Hidden Valley® Simply Ranch in the dressing aisle at your local supermarket or Walmart super store. It comes in 3 delicious flavors. You can go with the Classic Ranch or spice things up with the Cucumber Basil or Chili Lime! For the chicken, you can use rotisserie chicken, leftover chicken, fresh grilled chicken or any type of cooked chicken you have on hand. To make the wraps, simply fill an 8” tortilla with cheese, cooked chicken, minced cilantro and lots of ranch dressing. Grill on a pan for a few minutes per side to crisp up the tortilla and melt the cheese. If you’re in the mood for more, go ahead and add some diced avocado, tomatoes, cooked bacon, lettuce or whatever your little heart desires and enjoy these tasty wraps any time of the day! Lay tortillas on a clean flat surface. 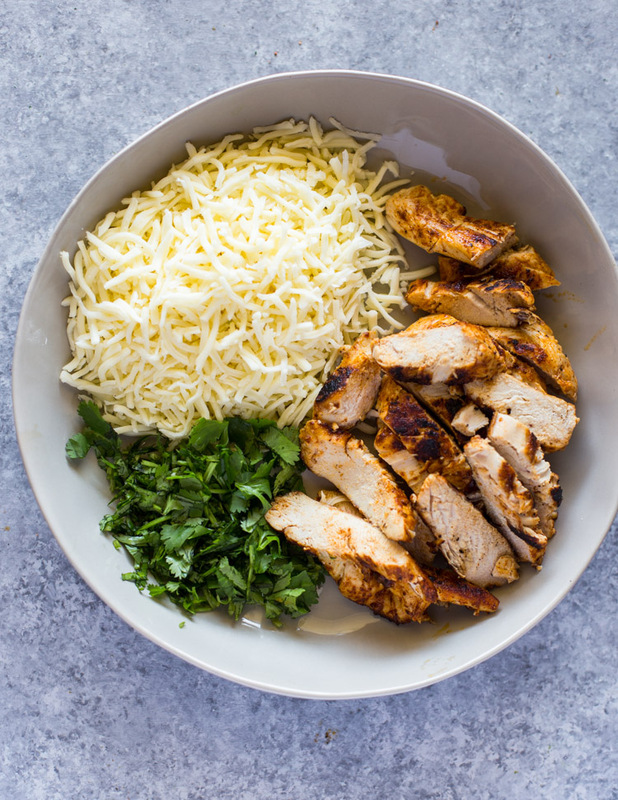 Place about 1/2 cup chicken, 1 tablespoon ranch, 2 tablespoons of cheese, and 1 tablespoon of minced cilantro on each tortilla. Fold tightly to form a burrito shape. Heat a heavy-duty pan or grill to medium heat. Coat with a light layer or oil or cooking spray and cook wraps for 1-2 minutes on each side or until the tortilla is crispy and golden. Remove from heat, slice in half and serve immediately. *For the chicken: You can use cooked rotisserie chicken, leftover chicken, or grilled chicken seasoned with your favorite spices. I like to season my chicken with a tablespoon of fajita seasoning and grill in a hot pan for 5-6 minutes per side or until cooked through. This is a sponsored conversation written by me on behalf of Hidden Valley® Ranch. The opinions and text are all mine. I roasted at 15 lb Turkey yesterday. Do you think this would work with leftover Turkey and I can season? Also, is it ok if I pin this? has anyone tried freezing and reheating these? You’re making me hungr… I think I just heard my tummy growl. hahaha! How do you think greek Yogurt based ranch would taSte with this? I mix greek yogurt with dry ranch dressing mix. that would be the bombe! Can these be served cold ? Added bacon, used cheddar cheese and left out the cilantro. I don’t have a grill so I baked them at 375 for 8 minutes (flipped halfway). Soo good! Thanks for sharing. My kids loved this, wE even made a few with buffalo hot sauce with ranch, and some with buffalo hot sauce and blue cheese. Super simple recipe for a weekday meal. What are you trying to figure out Janie? The directions are in the recipe box. We made these tonight and since we are not fans if cilAntro, we used spinach leaves and iT was awesome! We will be making again!! can’t wait to try this wrap as I know it will be a super delight for my family & friends. Thanks!! Are the nutritional facts indicating that serving size is per wrap aka 1 wrap? Is this a recipe for diabetics? On the video attached to this page, What kind of spice did you use to rub the chicken Brest? Love this!!! I will be searching for the HV Simply Ranch, I love that it is just normal food, no chemicals or preservatives. I wonder about GMO’s. But recipe looks great! Thank you so much. Your video was really good too. Simple and delicious! we’ve been making them weekly for a few weeks now! This was a hit at the house. We used Buffalo chicken with some extra sauce mixed with ranch. My folding skills are still needing some help… lol I ended up cooking mine in a pan with a little oil. But these tasted delish, even after reheating for a late night snack! Will make this again anytime! Could these be made in advance and froze in individual bags? I haven’t tried freezing them but I would imagine you can! Great recipe, simple but tasty. But it’s drowning in advertisements and the quality of this post just isn’t as good as usual! I am making these this week!